Indian Dental Association Kunnamkulam branch was inaugurated officially by Mr. Alkesh Kumar Sharma, IAS the then District Collector of Thirssur on 3rd September 2000 at IMA hall, Kunnamkulam. The founder president Dr. T.A Cheriachan was collared by the then IDA Kerala state President Dr. N.O. Varghese. The then Hon.Secretary Dr.Alias Thomas was also present in the occasion. Dr.Hariprasad and Dr.Siby.C.Chungath started regional dental club of Kunnamkulam with the strength of 20 members in 1998. This was christened into IDA Kunnamkulam branch in 2000 by the hard work of Dr.Cheriachan(The founder president), Dr.Sushanth(The founder secretary), Dr.Giju. Cheeran(The founder treasurer), Dr.Poulosekutty.M.K(The senior most member and secretary of IDA Thrissur) and many others. 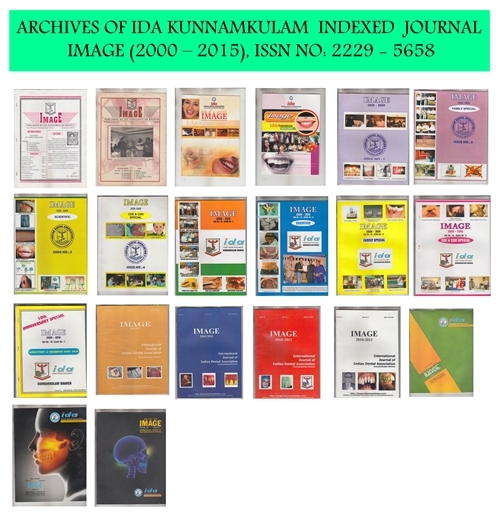 IMAGE is an official, scientific and professional journal published by IDA Kunnamkulam branch. It has an international indexing by Index Copernicus International Trade Mark and it has International Standard Serial Number: ISSN 2229-5658, allotted by Council of scientific and industrial research, New Delhi – an affiliate of ISSN Center of Paris. Dental science, Medical science, Association articles, General articles, Scientific researches and Surveys, Current topics, Messages, Interviews, Creations, etc are the topics dealt in this publication. Dr.Joji Goegre, the editor of IMAGE had achieved IDA national award for best local branch journal in 2009 at Mumbai. It had also achieved special appreciation award and best journal runner up award by IDA Kerala state in 2009 and 2010 respectively. Dr.Joji also achieved IDA national award for best local branch journal & electronic journal award in 2010 at Jaipur. Dr.Mercy joji is the newly elected editor of the first international journal-IMAGE 2010-2011.